Alpha 6 Patch Notes Can be found right here! 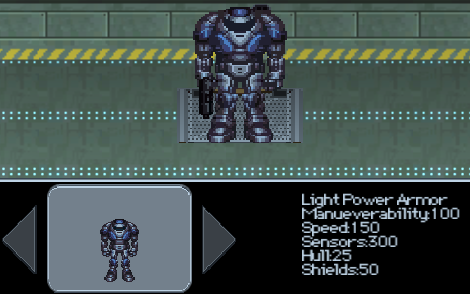 Alpha 6 brings the first steps of the much anticipated Power Armor system to the game. The armor is meant for mid to late gameplay so those hoping to jump into the armor immediately will be a bit disappointed. The armor is meant long term in order to "beat" the game and mix up the gameplay. Due to the pure scope of the Armor system and the large amount of save fixes all previous saves are no longer usable. For the past 6 months this has been avoided, however there were still a lot of save and load bugs that would occur. So to truly make the system work properly this was needed. Alpha 6 does however adds a new character class known as the Pilot/Marine. These pilots can then be loaded into a set of power armor by assigning them to a squad and launching them from the ship. This update allows for the ability to customize the armor and adds a lot of previous locked research to the current trees. The current system allows for pilots to be launched from the hangar bay and aid in attacking enemy ships. Be careful with them however as their ships will become damaged from wear and tear as well as have the possibility of taking incoming damage in the event of combat. Next steps is more improvements to the crew now that all crew types are in and working as well as fill in the gaps of waiting time between events. As always bug fixes will continue to be added to the game. Also in looking at the game's remaining development steps and the current competition on the market the price of the game has now been reduced to $9.99! Pick up a copy if you haven't already or send a copy to a friend! There are already many hours of gameplay and even more to come.